So in after a couple of days cooking at Camp Bestival with Ms Marmitelover it was back up the M5 from Dorset to cook for this wedding and set up 4 other events, before heading back down to Dorset at 5am on Sunday morning - busy. The risotto is made with pearl barley rather than rice - adapted a recipe from here. 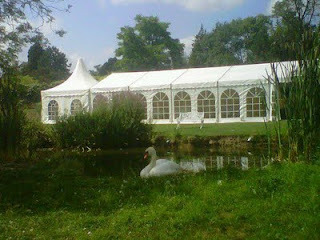 There's lots more photos from this event on the facebook album here: Wedding 30 July 2011. Forgot to take pics of the canapes though - so much going on. 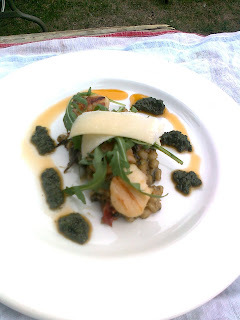 Wow I have never tried nettles before as the thought makes me a bit nervous, but this dish looks fab. P.S. - thank you so much for all the delicious pork pie ideas! You should try them - nature's bounty. Bit like spinach, but more earthy. There's some nettle picking tips here btw: http://www.thecotswoldfoodyear.com/2008/04/1001-kitchen-tips-21-top-nettle-picking.html and a whole load of other nettle related posts linked there. Amazing more people don't use them. Risotto dishes are one of my favourites anytime....looks delicious!